New children's playground is expected to be opened today in the Kamenitsa Park by that city sub-area's Mayor, Ivan Totev. More than 50,000 BGN were invested in the playground by the municipal budget, and a few more are expected to follow suit in near future. 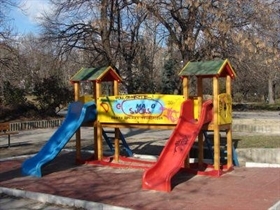 The municipality has a budget of 960,000 BGN for the construction of 120 playgrounds all around the city.